“Two city women – a century apart – find love and adventure with rugged men in the Queensland outback. Here she meets Luke Sherman, a man embroiled in the bitter ending of his marriage and a heart-reaking separation from his two small boys. Shelley resists an instant attraction to Luke as neither is ready for a new relationship. An old family photograph sparks Shelley’s interest in learning more about her family, in particular her great-great grandfather, Alexander Baxter. Having recently broken up with her boyfriend, Jason, and trying to keep her mind off him, she puts in for some leave from her job in Brisbane and finds herself in Clermont, heading to Breakaway Creek in an attempt to uncover the reason why her grandmother is so reticent to share information on her ancestors. Making contact with Luke Sherman, one of the two brothers who now live at Breakaway Creek, her plans are set in motion after she makes an arrangement to visit him at the property in order to view the photographs and information contained in the Family Bible. Envisaging an “old, crusty bushie”, she’s shocked to find that Luke is a far cry from her imaginings but even more dismayed when the information from the Family Bible and the writing on the back of the photograph yields more questions than answers. When Luke offers to speak to his parents, currently travelling in Europe (if Shelley agrees to stay on for a few days in exchange for some housekeeping duties) it doesn’t take her long to decide that her trip would be wasted if she left without the information she is after, and that a few days on a working cattle property would be a welcome experience. Luke is a man who has been deeply hurt. Following the breakdown of his marriage, he’s trying desperately to find a way to get his two small boys back and harbours great resentment towards his estranged wife, a born and bred city girl, who has since returned to Brisbane with his children in tow, leaving him heartbroken and with a rather cynical outlook towards the sanctity of marriage. Both Shelley and Luke are looking for a distraction from their current relationship woes, and despite their obvious mutual attraction, neither of them feel they are ready for the complications of a new relationship, so when they visit the old ramshackle homestead and discover a port with a lot of useful information for Shelley’s research, the days which follow see them sifting through the paperwork and becoming enveloped in the past lives of Alexander and Emma. When Shelley finally learns the truth about Alex and Emma and inadvertently becomes embroiled in the present day drama heading Luke’s way in the form of his estranged wife and the safety of his children, they soon discover that not all city girls are cut from the same cloth! What initially drew me to this novel when Heather Garside requested me to review was the premise which piqued my interest as I am a passionate family genealogist. For many years I have been trying desperately to glean information on my maternal great-grandparents who were born in Portugal and immigrated to South Africa in the early 1900’s. Unfortunately, I have been rather unsuccessful in finding too much information as my great-grandmother passed away when I was about eight years old and my grandmother passed away in 1990. Of course, while members of the family are still alive, they have so far been unwilling to share any information they have (quite possibly because of some alleged “shocking” family secret) and I could so easily relate with Shelley as she diligently went about her search without receiving the initial push and assistance from her grandmother. The fact that she and Luke discover a port tucked away in the dilapidated original homestead calls to mind a story that my mom told me - that my great-grandmother also had a suitcase with lots of photographs and other documents, which disappeared shortly after her death. I found this to be a rather enjoyable novel which, right from the prologue, had me wanting more as Ms Garside created an air of suspense which left me feeling that I just had to discover the dark secrets buried in Alexander and Emma’s past. In taking that step back in time (and a life that we will only ever be able to live through characters in a book), Ms Garside has also offered us some insight into a bygone era and the social decorum of pioneering life in Australia during the late 1800’s. Her main characters of Luke and Shelley in the present and Alexander and Emma in the past are very well rendered as Heather keeps their actions, speech and general day-to-day life consistent within their time-frames, all perfectly executed through the dual timeline as it shifts seamlessly between past and present. Along with the dramas that come into play in their lives, there are some heated moments of passion and, particularly in Alexander and Emma’s story, I was able to feel their desperation as they struggled to endure the rigid propriety of the times, the injustice of nineteenth century prejudices and the risk of social ostracism in their pursuit of forbidden love. Part historical, part contemporary, this romance has a lot to offer and there is an underlying realism to the story which, through the narrative, offers a stark reminder of the challenges faced by our early settlers as well as those faced by our modern day society, such as social problems in the form of child neglect and the dry and desolate place the Outback can be in times of drought. Nonetheless, we see that love in the Outback was and still is possible, while the beauty, freedom and adventure of bush life, although harsh at times, is still something to be experienced, even if you are a city girl! 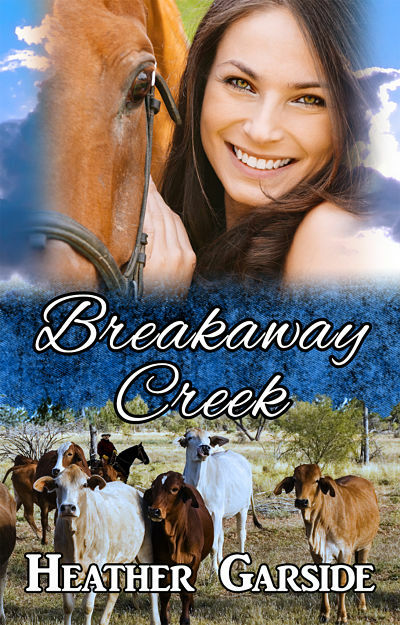 Moderately paced, with two strong heroines at its heart, Breakaway Creek is an easy to read novel which will appeal to readers who enjoy a romantic tale with a hint of adventure set in the Australian outback. 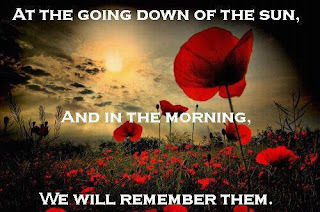 I look forward to reading more from this Australian author and, as I leave you with the beautiful words of the second stanza in Dorothea Mackellar’s “My Country”, I wish to thank Heather Garside for providing me with an eBook copy of her novel. Her short story, Coming Home was selected for inclusion in one of the RWA's Little Gems anthologies and the same story and her poem, Drought, was recently printed in Idiom 23, the Bauhinia Literary Awards magazine. I am so glad your busy 'real' career hasn't stopped your reviews. You have a wonderful knack for communicating what you enjoy in stories. I don't share your passion for geneaology, however, my sister does, and she's the one who's been sorting out our family tree. No shocking secrets there from what we can tell! Good luck with your own research, and thanks again.